Place the various Toobeez tubes on the floor. 1. Circle up the group, and discuss with students the difference between sets and repetitions while exercising. 2. Read the following Activity Challenge Box to the group. Plyometrics are exercises that involve rapid stretching then shortening of a muscle group during movements. Plyometric exercises help build basic muscle strength, power, and speed. 4. Discuss proper form with the students: The feet should be shoulder-width apart and the hands should be placed on the hips. Students’ knees should remain bent slightly so they use their calf muscles. 5. The teacher should select a student to demonstrate the calf jump. The volunteer should jump slowly back and forth over the tube. 6. At this point, the teacher should point out the use of the calf muscles during the demonstration. 7. Now each student can take a turn to jump over the tube. Have each student work their way along the river. Stagger the students so they avoid colliding with one another. 8. After the activity, move to the “Activity Discussion and Processing” section of the activity. How was your body affected by completing these exercises? How did this activity help you to work with your partner? What steps did you follow to build the mini hurdles? What were the differences you experienced by doing the various kinds of movements? How did you feel after you completed your set of ten repetitions? 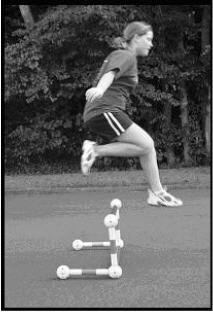 Complete this activity in the same way, but have the students lift one leg off the ground when jumping. Have the students attempt to spin as you jump. The goal is to spin 360 between jumps using both feet. 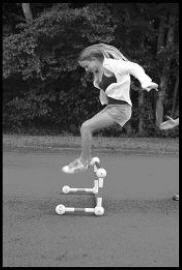 After the students experience success, have them create a mini-hurdle using the 11” and the 16” tubes. A demo should be completed prior to this variation so the students can duplicate the movements for their pair. With their partners, have students take turns jumping, leaping and hopping over the hurdle. Each student should complete one set of ten repetitions. 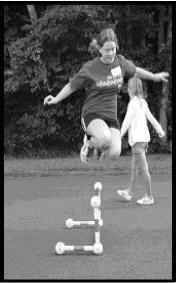 Students can then advance to attempt a one-legged calf jump or a calf jump spin over the hurdle.